Members of The Time Jumpers are, in front, from left, Kenny Sears, Dawn Sears, Jeff Taylor and "Ranger Doug" Green. Middle row: Dennis Crouch, Joe Spivey, Paul Franklin and Billy Thomas. In back: Andy Reiss, Larry Franklin and Vince Gill. * Dennis Crouch: upright bass -- Played with Elton John, Gregg Allman, Diana Krall, Leon Russell, Willie Nelson, Steve Earle. * Larry Franklin: fiddle -- Played with Kenny Chesney, Grace Potter, Randy Travis, Alan Jackson, Loretta Lynn, Vince Gill, Lauren Alaina, Brian Wilson, Reba McEntire, Shania Twain, Lady Antebellum. * Paul Franklin: steel guitar -- Played with Sting, Mark Knopfler, George Strait, Alan Jackson, Shania Twain, Barbra Streisand, Megadeth. * Vince Gill: vocals, electric and acoustic guitars -- Played with Eric Clapton, Keb Mo, Barbra Streisand, Joe Bonamassa, Elvis Costello, Mary Chapin Carpenter, Bill Gaither, Steve Martin, Rita Wilson, George Jones, Charlie Haden. * "Ranger Doug" Green: vocals, acoustic rhythm guitar -- Toured with Bill Monroe and the Blue Grass Boys and co-founded Riders in the Sky in 1977. * Andy Reiss: electric guitar -- Played on hundreds of hits, including Grammy Award winners "Amazing Grace" by B.J. Thomas and "Does He Love You" by Reba McEntire and Linda Davis. * Kenny Sears: vocals, fiddle -- Toured with Mel Tillis, Ray Price, Faron Young, Dottie West. * Joe Spivey: fiddle, vocals -- Recorded with John Anderson, Merle Haggard, Shania Twain, Faith Hill, Kris Kristofferson, Joan Baez, Hank Williams Jr., Clay Walker. * Jeff Taylor: accordion, piano -- Recorded with Elvis Costello, Paul Simon, Harry Connick Jr., Keith and Kristyn Getty, Amy Grant, George Strait, The Chieftains, Martina McBride, Buddy Greene, Vince Gill, Ricky Skaggs. * Billy Thomas: drums, vocals -- Toured with Patty Loveless, Emmylou Harris, Steve Wariner, Marty Stuart, Ricky Nelson, Don Williams, Earl Scruggs, Dolly Parton. Is Gill's touring drummer. * What: A Song for the Children with Vince Gill and The Time Jumpers. * When: 8 p.m. Friday. * Admission: $35 and $50 general; $175 VIP. * Phone: 642-TIXS, 757-5050 general admission; 266-6918 VIP. * Note: General-admission tickets are sold in advance by phone, online or at the Memorial Auditorium box office, 399 McCallie Ave.
VIP tickets, $175, come with the following privileges: premium concert seating, cocktail hour and dinner party at Loose Cannon, optional transportation to and from the Tivoli and a dessert reception after the show. Call 266-6918 to purchase. Vince Gill will be bringing a few of his musician friends with him for an annual benefit on behalf of the Children's Advocacy Center of Hamilton County. They are known as The Time Jumpers, and collectively they represent about a million years' worth of history and experience via touring and/or the recording studio. The mini-bios included here represent a fraction of who these musicians have played with. Kenny Sears, for example, has toured with stars such as Dottie West and Faron Young, but he is even better known as one of Nashville's preeminent fiddle players. He serves as the group's emcee onstage. Even he is sometimes overwhelmed by what he hears from the group. "Oh my gosh, it happens all the time," he said. "There've been times in the past that I'll get so involved in listening to somebody else that's just KILLING a solo that they are doing on the spur of the moment that I forget to come in play and I'll just be an audience member. "I do the emceeing, and I would stop and tell the lady at the front door, 'Excuse me, I'll be over to buy a ticket in a minute.' "
Sears said he's not alone in having been distracted by the talent level. The group started as a friendly jam session "in studio No. 7" backstage at the Grand Ole Opry. There to play with other acts, the musicians would gather and just jam. "Several of us would miss spots onstage because we'd just be back there jamming and having a good time," Sears said. So much so that they looked for a bigger place. Someone discovered that The Station Inn was closed on Monday nights. They spoke to the owner, who agreed to let the guys in. 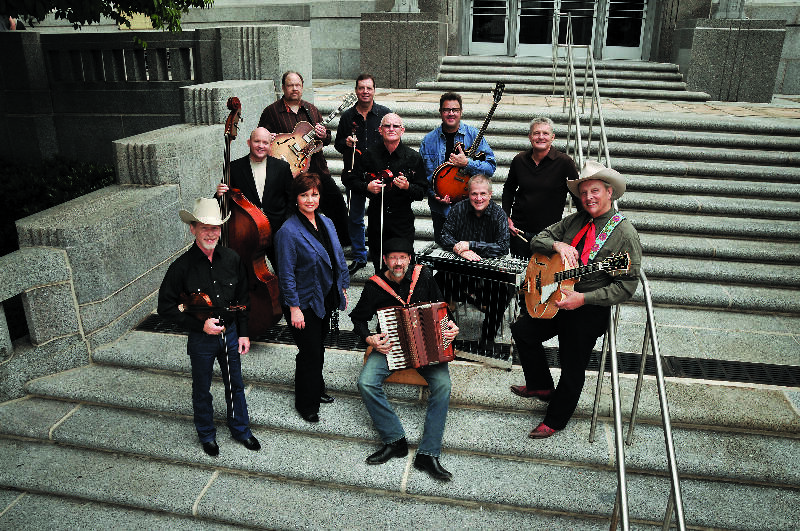 The Time Jumpers officially became an organized group with a name in 1998. "Some of those early shows, we outnumbered the audience," Sears said. That didn't last long though, and pretty soon people like Bonnie Raitt, Reba McEntire, Robert Plant, The White Stripes, Kings of Leon and Jimmy Buffet were dropping by. Eventually, The Station Inn couldn't handle the crowds, and the group moved the Monday Night pickin' to Nashville bar 3rd & Lindsley. Things have progressed to the point where the group released its first studio album last month. Sears said Gill asked the guys if they would be interested in joining him for the concert Friday to benefit the Children's Advocacy Center. It's a show that Gill has done for several years now, but a first for the band. "We all have our own schedules and obligations, but we are very glad to be doing this," Sears said.